If you’re the kind of woman who wants Mermaid hair like Sarah Jessica Parker’s instead of the bouncy and tight curls that Keri Russell used to sport, you may have already tried various types of curling wands and still did not get your desired result. This article will tell you why the Nume Reverse Curling Wand may be your best bet to get those awesome beachy waves that you have always wanted. How can the Nume reverse curling wand be different or even better than the other curling wands out there? This unique curling wand is larger at its tip with its barrel becoming narrower as it tapers towards the handle. Yes, this curling wand is kind of odd-looking but such oddity is also its asset. You read that right. The Nume Clipless Tourmaline Hair Curling Wand Reverse may be odd-shaped for a curling wand but it’s precisely that reverse cone-like design which enables you to create curls which are narrower at the ends of the hair and larger at their roots. With the Nume reverse wand, you are always guaranteed gorgeous curls that not only look good but hold longer, even after you sleep. Whether you have thick, curly, coarse or medium-length hair, if you want soft and billowing-in-the-wind spirals or just simply natural-looking locks, you really should consider getting the Nume wand. And if you still aren’t convinced, this review should help you discover what makes the Nume wand an invaluable hairstyling tool. The Nume Clipless Tourmaline Reverse Curling Wand – Now Available at Amazon! Dual voltage of 110v-240v at 50/60Hz. Operates at 45w in the U.S. and 25w in Canada. Edison Testing Laboratories (ETL) certified. Length is 13mm to 25mm from base to tip. Available in solid black and combination pink (barrel) and black (handle) colors. Made of ceramic infused with 100% tourmaline gemstone that makes for a soft and smooth surface to prevent damage and dryness to your hair. Ergonomically-designed handle for your easy operation. With fast heat recovery that ensures “no waiting” time. Heats up to a temperature of 410°F in just a few seconds. Hair’s natural oils and moisture are locked in with far-infrared technology to give your hair additional luster and shine. Has a converter to handle dual voltage between 110v and 240v. Comes with a protective glove that is heat resistant to prevent accidental burning of your fingers and/or hands. Clipless design ensures that your curls are free from crease lines and kinks. With advanced Metal Ceramic Heater (MCH) mechanism that has no open flame, is safe, with small resistance, reliable, self-insulating, and is more powerful. Its negative ions reduce your hair’s frizz and static for more shine and manageability. Rounded barrel can create not only waves for your hair but flips and curls as well. Its tapered barrel creates tighter curls near your scalp and slightly wider curls towards the ends of your hair. Clip-free design: this prevents your hair from snagging or tugging while you curl it, leaving no traces of crease lines or kinks. Tourmaline gemstone content is 100%: the tourmaline maintains even distribution of heat from curl to curl. Simple to use: even newbies in hair curling will find it easy to operate the Nume curling wand model. Advanced MCH technology: this enables the wand to heat up instantly and give the barrel’s surface consistent temperature. No need for additional hair products: curls created by this wand will hold very well so you won’t need any additional hair products. Lightweight: at 1.2 pounds, you can bring this Nume curling wand if you travel frequently. No heat control feature on the off/on switch: this may prove disadvantageous to those with thin or fragile hair since the heat automatically rises to a temperature of 410°F. No automatic shut off mechanism: there is no light that indicates whether the tool is still on which is another disadvantage for those who forget to turn off appliances after use. 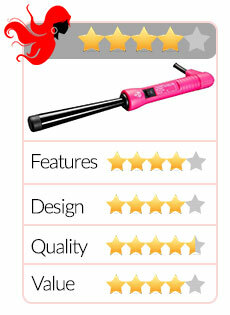 Price: this Nume wand is comparatively expensive amongst other curling wands with similar features. There is no doubt that Nume hairstyling tools are premium quality equipment and their curling wands are definitely no exception. Its use of ceramic tourmaline technology assures you that the amount of heat on your hair is more than sufficient for curling. The negative ions from the ceramic tourmaline lock in your hair’s natural oils and moisture so you don’t have to worry about your hair drying out, becoming brittle, and eventually splitting or even dying. This particular Nume wand has excellent instant heating capability but the common “drawback” pointed out by more than one Nume curling wand review is the absence of a temperature control feature that doesn’t give the customer any choice on how much heat the hair would actually need for curling. The heat-resistant, protective glove that comes with it is great of course, but then again, this kind of glove comes with a majority of curling wands as well, so that’s not such a big deal. The dual voltage feature is something that frequent travelers to foreign countries will like because of the accessibility to different power levels but this feature won’t matter much for the average home user. Additionally, there is no mention of any warranty on its packaging and a quick internet research will reveal varying periods of time which isn’t much help for those who are investing in this Nume curling wand. The free shampoo that comes with your purchase is a nice touch. Should you buy the Nume Reverse Curling Wand? If budget isn’t an issue with you and you are more-or-less adept at using a curling tool without clips or clamps to hold your hair, then this wand will be suitable for you. If you have really long hair or hair that’s coarse, unusually thick, unruly or difficult to curl, this curling wand would be ideal for you as well. If you base your purchase on the features that the Nume Reverse Curling Wand has, you may find the price quite reasonable. 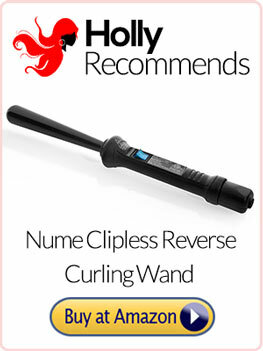 Click Here for the Nume Clipless Reverse Curling Wand on Amazon!